It's a race against time as Captain Video and his Rangers travel the globe to stop the evil Hypnox in "Captain Video and the Secret of the Sun City!" 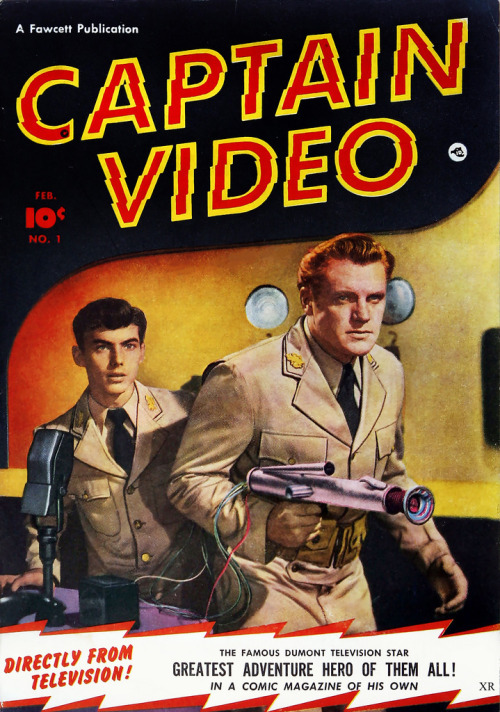 You might remember Captain Video as the groundbreaking first American science-fiction television series, written by such noteworthy authors as Arthur C. Clarke, Issac Asimov and James Blish. But it was also a short-lived Fawcett Comic book that ran for six issues in 1951. Both Captain Video stories in Issue #1 were expertly drawn by cartoonist George Evans, and the art alone is worth the price of admission. Ever hear of a troglosauri? Neither had we until we read Rocketman #1! A one-shot comic from Farrell(Farrell would take up Rocketman's numbering with Strange Fantasy #2 (Oct. 1952)), Rocketman features interplanetary tales purportedly set in the year 25,000. The good news is America is still around then. The bad news is that every planet in our solar system is inhabited by folks that have no reservations about slavery, interstellar blockades, or kidnappping. Fortunately, Rocketman is quick to the rescue, and although he does his fair share of bumbling through the adventures, he always seems to come out victorious in the end. It's a shame we don't know the arist as some of the artwork is fantastic (although a cursory examination shows similiarties to the work of Henry Keifer). And we're huge fans of the cover art, too!